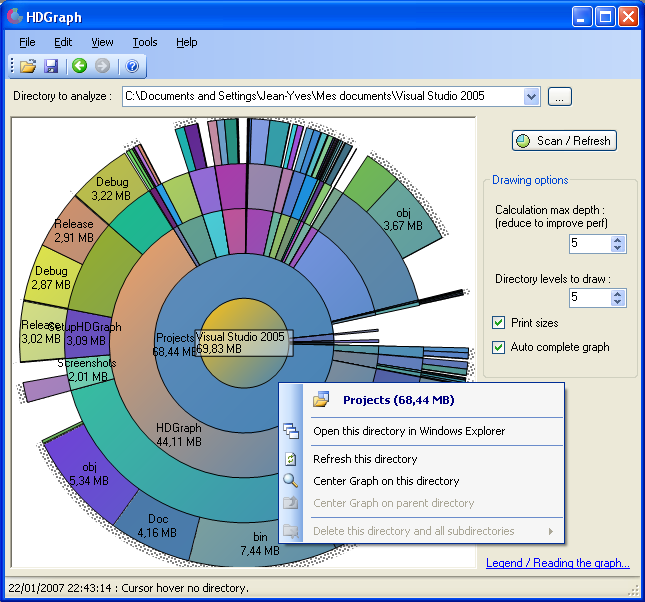 HDGraph 1.0.1 HDGraph helps you to free disk space : it finds for you the largest folders on your drive. In facts, it's a tool allowing to graphically display the hard disk space usage : it shows all the directories and subdirectories of the hard drive on a single graph, allowing to see the largest directories at a glance. Windows XP, if you have the Microsoft .NET Framework installed (v. 2.0 or above). This framework is free and can be downloaded at Microsoft. HDGraph is free. It is released under the terms of the CeCILL license. It can be distributed or modified according to this license. More information on the HDGraph license page.